Nutrition can be overwhelming. Trying to claw your way through the conflicting information to work out how to eat a healthy diet is stressful. Every month there is a new superfood that we ‘should’ all be eating. And headlines about why your breakfast cereal is going to lead you to an early grave are far too common. The sad thing is that the basic rules of healthy eating are really very simple, we are just not taught what they are. But if you want to know, read on my friends. I am about to share them with you. 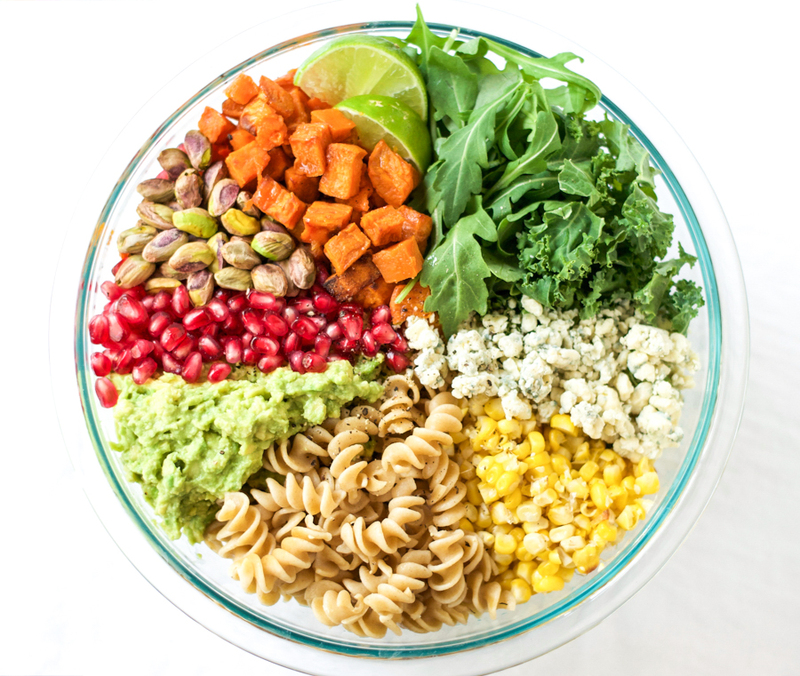 And this roasted sweet potato and avocado bliss bowl (created by my buddy Alyssa) is the perfect illustration. Eat plenty of fruits and vegetables in a variety of colors. More vegetables than fruit. 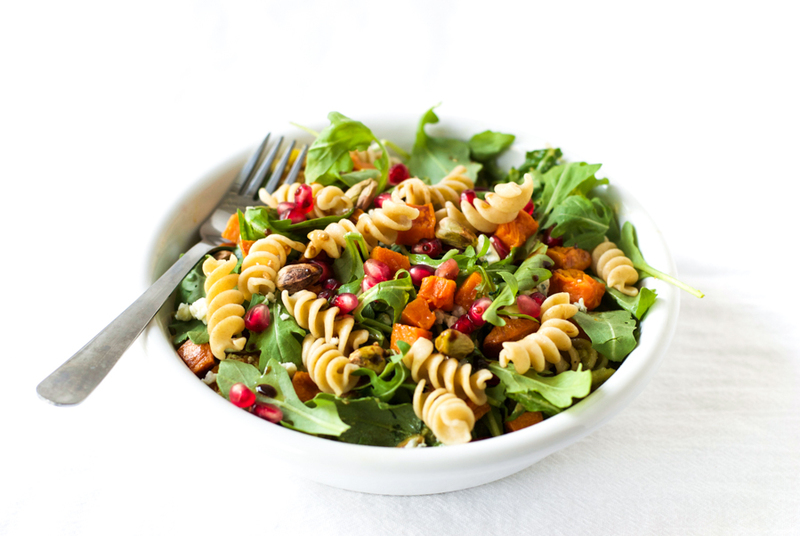 Include some whole grains in your diet. Eat lean protein like chicken, turkey, fish, eggs, beans, nuts, and seeds. Listen to your hunger and fullness cues. Eat when you are hungry, stop when you are full. Don’t eat too many sweet treats or calorie-dense snacks. Keep them as occasional foods. Drink at least 8 glasses of water each day. Try not to drink your calories in the form of sugar-sweetened drinks. 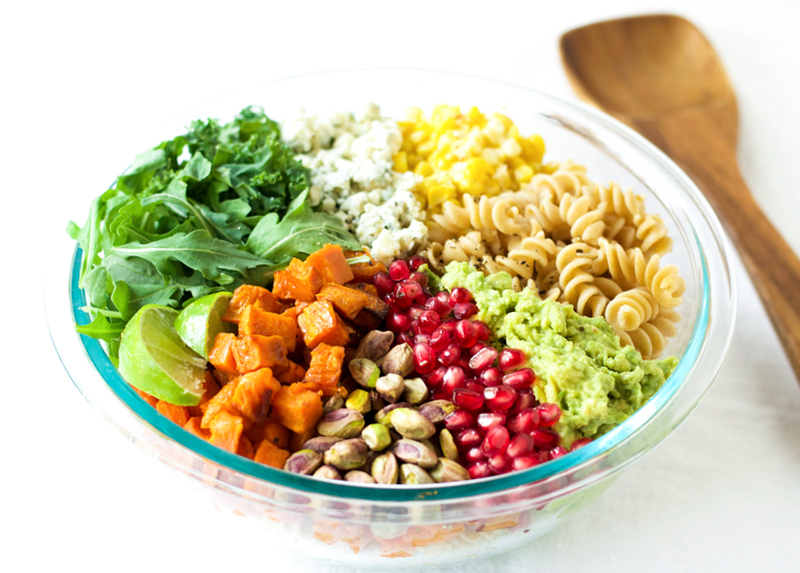 So what does this roasted sweet potato and avocado bliss bowl have to do with those rules? 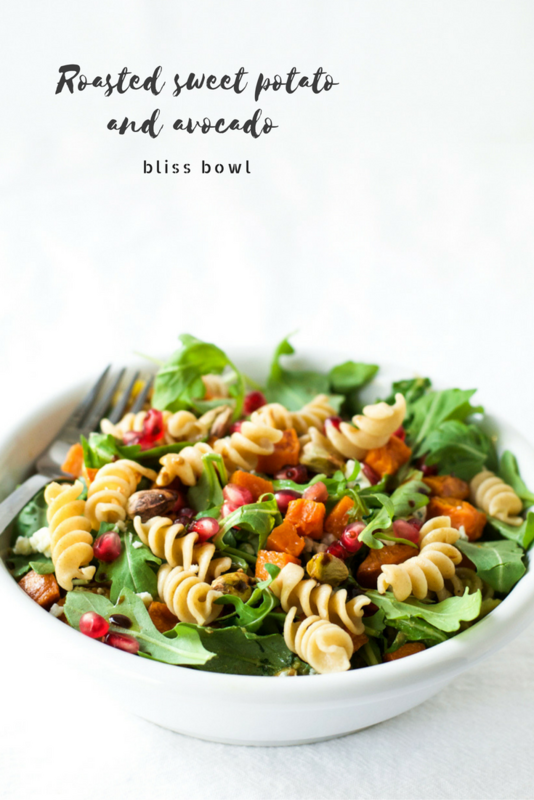 It is full of fruits and vegetables, it contains some whole wheat pasta (but not too much), there is protein in the form of pistachios, and the calorie-dense blue cheese is kept to a minimum. Now you just need to wash it down with a glass of water and stop eating it when you are full, and you have all the rules covered. Put the diced sweet potato onto a baking tray, drizzle with 1 tbsp of the olive oil, stir to coat the potato, and place in the oven for 15 minutes, or until golden brown at the edges. Once cooked, drain the pasta and set to one side to cool. Broil or boil the corn for around 6-7 minutes. Once cooked and cool, remove the corn kernels from the cobs using a sharp knife. In a small bowl mash the avocado with the lime juice. 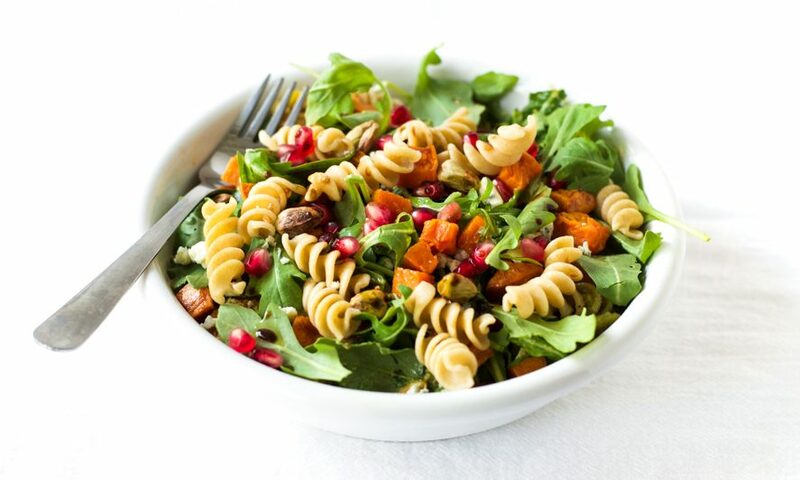 In a large salad bowl, mix together the arugula, kale, sweet corn, avocado, pasta, sweet potato, pomegranate seeds, gorgonzola, and pistachios. In a separate small bowl, whisk together the remaining 2 tbsp of olive oil and balsamic vinegar. I just stopped by to thank you for linking up at the Healthy Living Link Party and to let you know that you’ll be featured at A Chat Over Coffee this evening. Thank you so much for featuring my recipe. Sadly I didn’t make it to your link up this week because I was in bed with stomach flu. But I’ll be back next week! This looks and sounds divine! Thanks so much for sharing on the Healthy Living Link Party 🙂 We hope to see you back tonight! Pinned!